The idea of a self-contained, mobile, live/work artist's studio originated in 2006 while preparing for an exhibition at the Jonathan Ferrara Gallery in New Orleans. I wished for the ability to transport my studio from New York City to New Orleans for a period of several months, so that I could immerse myself in the culture and conditions of the damaged city, and create work in response. My experience of post-Katrina New Orleans made apparent the need for such a mobile structure to house displaced artists or enable visiting visual artists to engage with environments which have undergone disasters or are in a state of emergency. In the tradition of "combat artists" who went to war armed with paint and brushes, the Emergency Response Studio will allow artists to "embed" themselves in situations and respond creatively to unfolding events. The ability of the visual arts to aid in the understanding and transformation of such settings is the impetus for the Emergency Response Studio project: I believe we ought to consider deploying artists as part of the mix of disaster workers, medical personal, NGO's, architects and urban planners  those people charged with responding to, repairing and re-envisioning disaster sites like New Orleans. After Hurricane Katrina, the "FEMA Trailer" entered America's collective conscious, generally, with very depressing associations. This project re-purposes a used, 30' Gulfstream Cavalier travel trailer, virtually identical to the 50,000 trailers built by Gulfstream for FEMA. Between April and October, 2008, it is being transformed into a visually engaging, sustainably built, mobile, artist's studio. 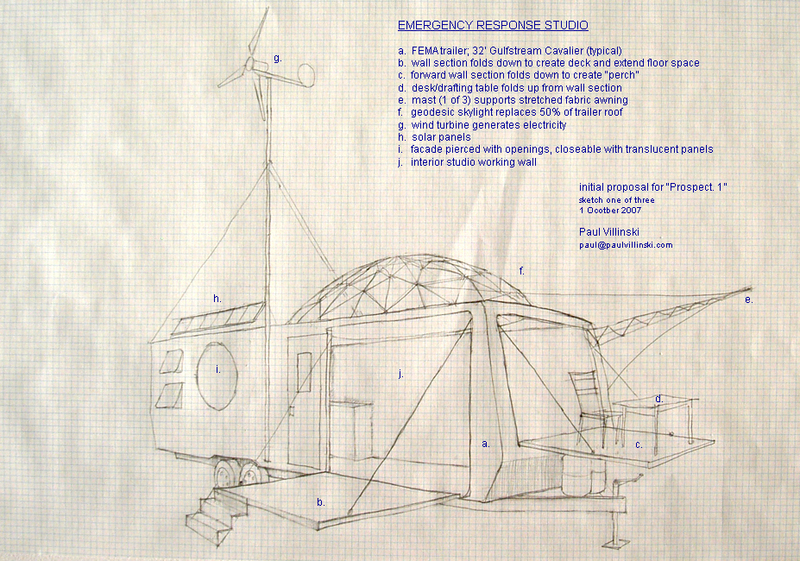 the Emergency Response Studio will be a green, "off-grid," structure, utilizing a sophisticated, photovoltaic solar system and a small wind turbine to generate all the electricity required for lighting, living requirements, and tools. Although the structure's origins will remain recognizable, the project playfully and purposefully deconstructs the template of the FEMA trailer. A large wall section cranks down to become a deck, opening the interior to its environs, and expanding the usable floor-space. A sculptural, stretched fabric awning made from recycled Kevlar sails will shade this deck and possibly collect rainwater. A ten-foot, elliptical, geodesic skylight will provide daylighting and raise headroom in the work area. A thirteen-foot wall section has shed its aluminum siding in favor of clear, twin-wall polycarbonate sheathing. A 35' high aluminum mast tilts up, supporting a "micro" wind turbine. A large battery box is constructed below floor level and covered with a thick lucite floor panel, revealing the 1300 lbs of batteries which store all the power for the structure. A large, roof-top array of solar panels will fold-up to face the sun and charge these big batteries. Sustainable, non-toxic materials replace the formaldehyde-ridden original materials: kitchen cabinetry will be constructed from bamboo-based plywood; flooring will be natural linoleum, made from linseed oil; insulation in ceiling and floors is made from recycled denim; paints and wood finishes are no- or low-VOC; and much of the wood used to re-frame and panel walls is re-used and is sourced from a local building materials recycler. Symbolically, the structure is expansive, both opening outwardly, and inviting the outside in, becoming a paradigm for the practice of the artists who use it. While designed as an artist's studio, the Emergency Response Studio can serve as a prototype for self-sufficient, solar-powered mobile housing, and explores the possible application of sustainable materials in the construction of trailers and other forms of temporary housing. The structure could have a wide array of uses, for example, in a disaster area lacking a working power grid, it could provide families or disaster workers with all the necessities of living through clean technologies. Through its use, its inhabitants as well as the people who see it will have an opportunity to understand and utilize a photo-voltaic system and a wind turbine, and to appreciate the place these technologies will have in our future. During the Prospect .1 New Orleans exhibition, the Emergency Response Studio will be situated initially in the Lower Ninth Ward, where I first imagined having a mobile studio, in the summer of 2006. During the course of the eleven-week exhibition, it will "migrate" to other locations within the city, probably to include the grounds of the New Orleans Museum of Art, Tulane University, and the area around Lee Circle in the Central Business District. The public will be invited to enter and explore the structure, and discuss it with a docent who will help to contextualize and interpret the project. The presence of the Emergency Response Studio in New Orleans during the fall of 2008 will call attention to the fact that, in many respects, the city remains in a state of emergency. At the same time, it speaks to our potential to imaginatively transform even the least savory aspects of our built environment. It demonstrates the viability of currently available "cleantech" solutions to provide energy and to create healthy, environmentally-friendly housing and work space, and models the application of these technologies in New Orleans and other communities into which it will travel. It suggests that the inventive, non-traditional thinking practiced by visual artists can be an valuable part of the mix as we attempt to heal what is damaged and confront imminent challenges of all sorts. 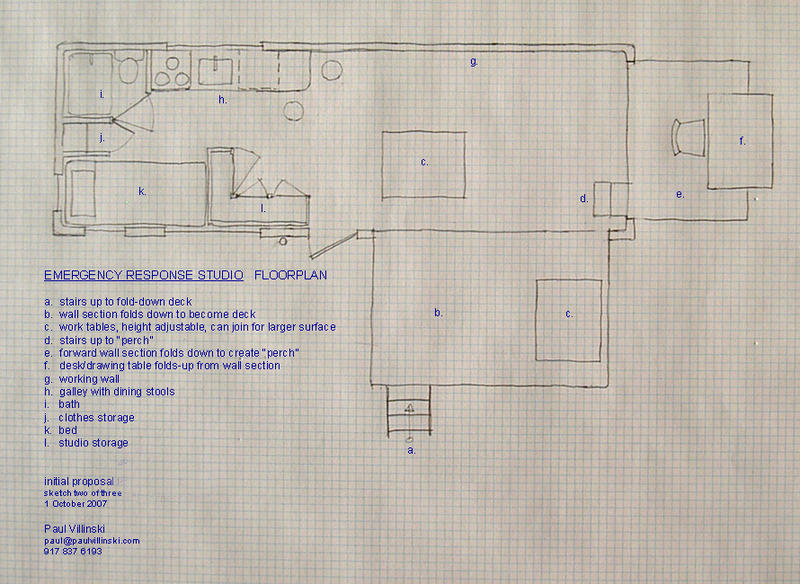 The Emergency Response Studio is a physical manifestation of hope for the future.